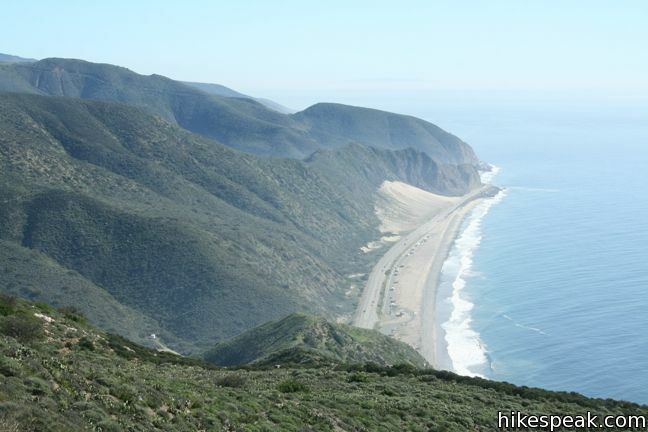 Just inland from that similarly named point along the California coast, Mugu Peak towers over the Pacific Ocean from an elevation of 1,266 feet. 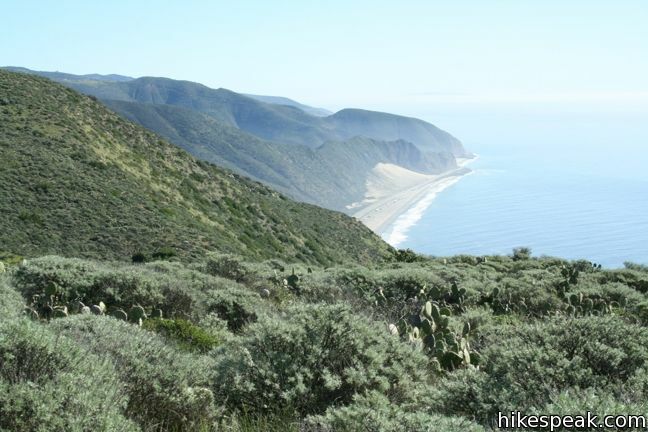 The hike from the bottom of nearby La Jolla Canyon to the top of Mugu Peak is 6.5 miles round trip with 1,225 feet of elevation gain. 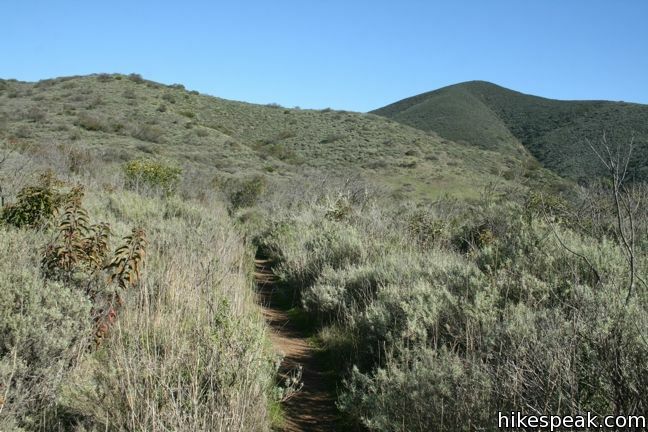 This is a strenuous trek, rewarded by ridiculous scenery. 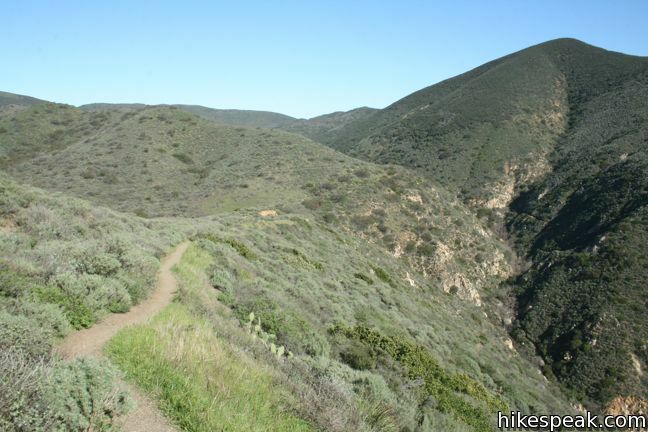 There is also a longer way to reach the peak, the 11.75-mile La Jolla Canyon Loop, and a shorter (read steeper) option, a 2-mile round trip hike beginning up Chumash Trail from another trailhead along Pacific Coast Highway. 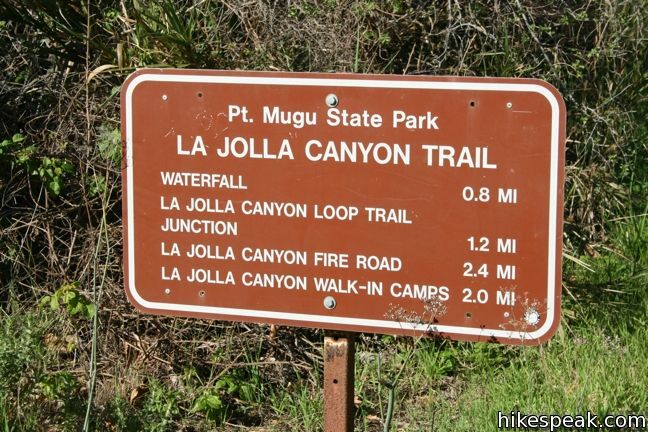 Update: La Jolla Canyon Trail was damaged in the winters of 2015 and 2017 and is closed until further notice. 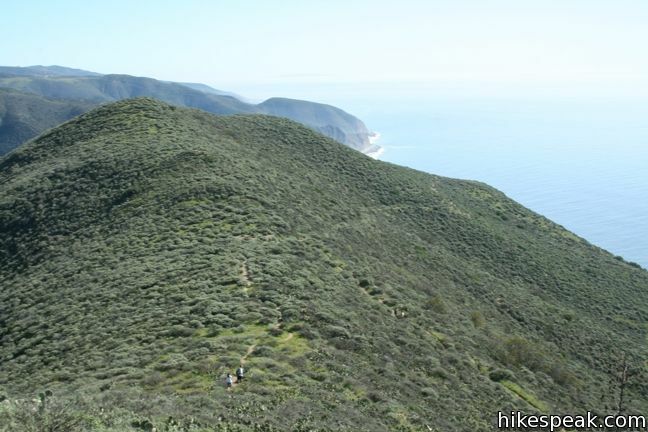 To reach the summit from La Jolla Canyon, begin by hiking 1.25 miles up La Jolla Canyon Trail. 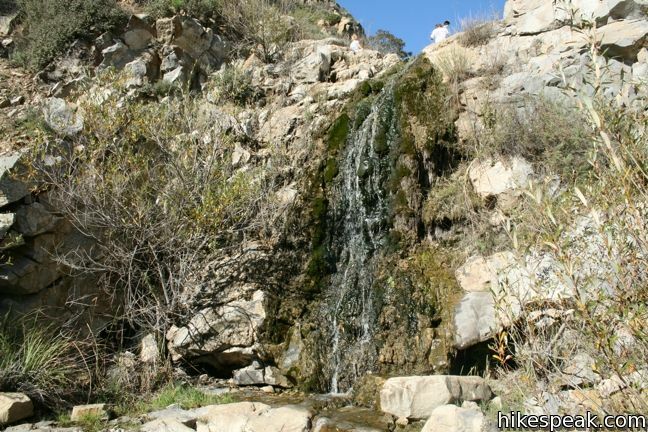 The trail is gradual for 3/4 of a mile, progressing up the canyon to a short seasonal cascade, La Jolla Canyon Falls. 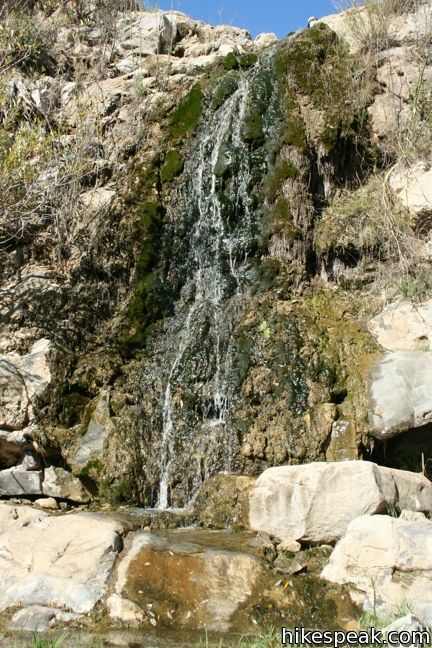 Above the waterfall, the ascent becomes more rigorous, with close to a thousand feet still to climb. 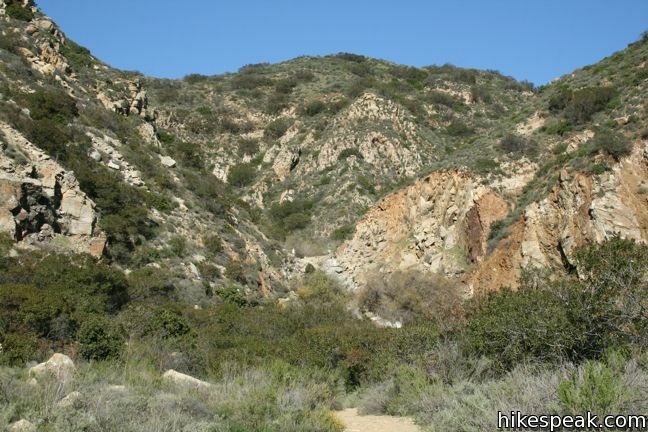 Take the switchbacks up the rocky wall of the narrow V-shaped canyon to a junction with La Jolla Valley Loop Trail. 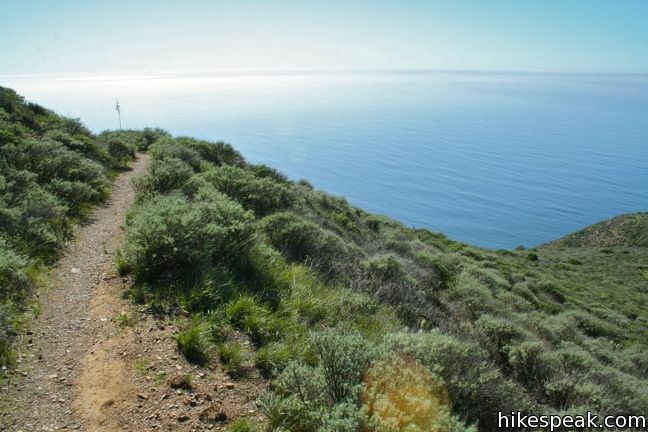 Turn left, following this track for 0.85 miles across the bottom of the valley that drains into La Jolla Canyon. 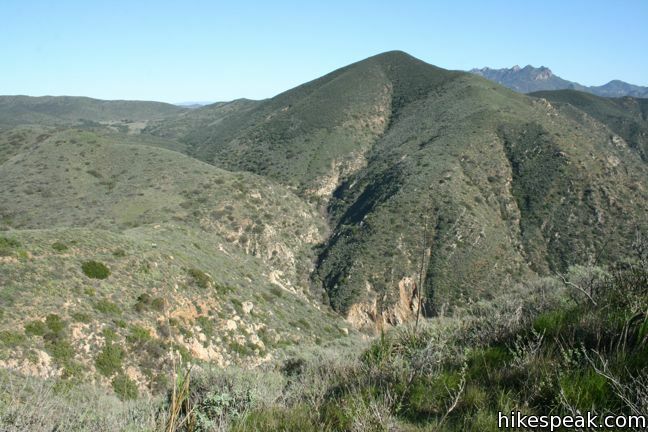 At times, the trail points directly at Mugu Peak, the summit bulging out of the ridgeline on the west side of the valley. 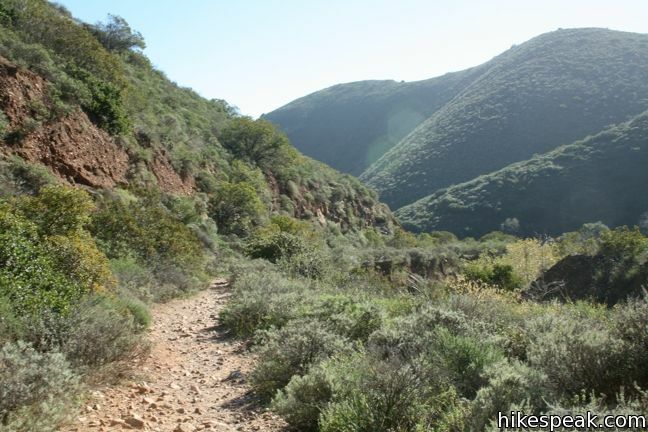 Turn left at the marked junction with Mugu Peak Trail, cross a small stream, and begin up the ridge. 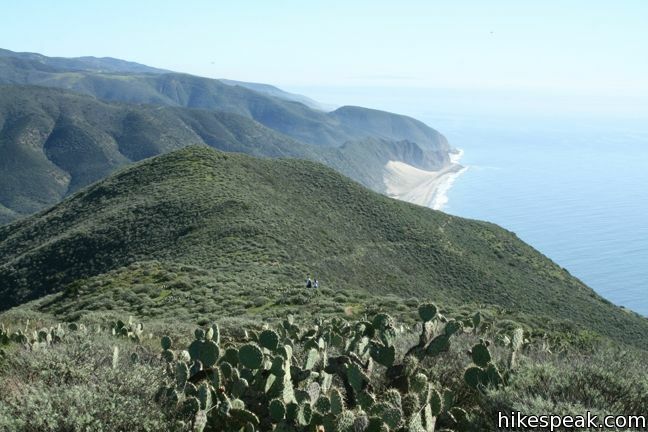 Riparian vegetation is replaced by sage and sporadic cacti, while views of the canyon expand, eventually giving way to ocean vistas. 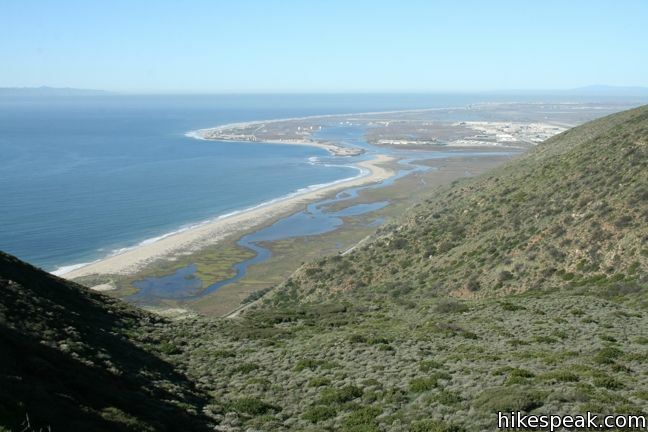 Dramatic finger-like green ridges touch down on the sandy shores to the east. 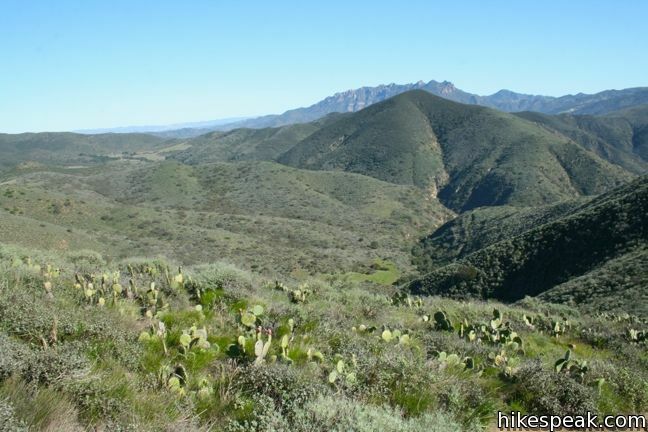 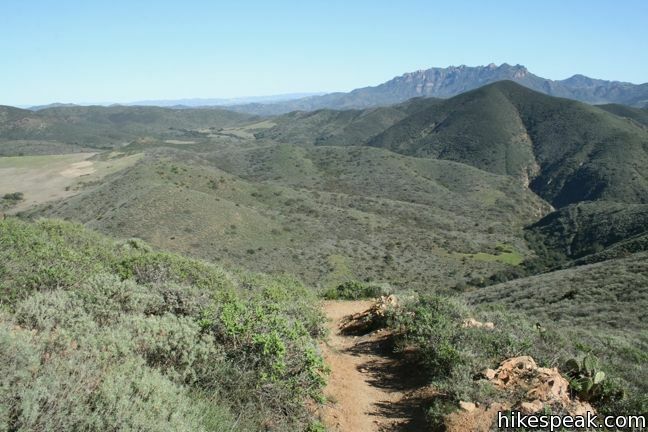 The blue expanse laid out below makes this one of the most scenic trails anywhere in the Santa Monica Mountains. 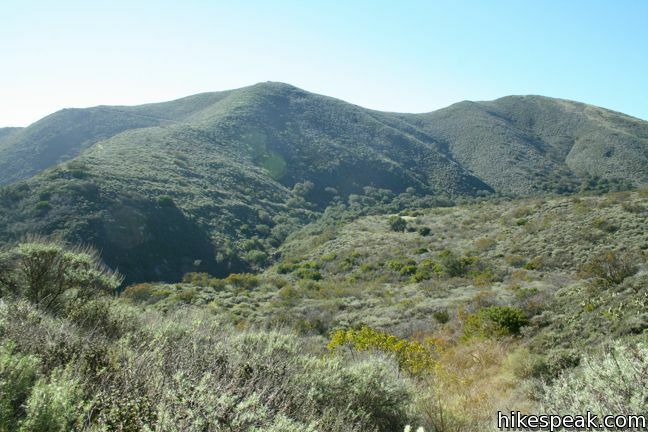 The southbound track turns west toward Mugu Peak and arrives at an unmarked junction with a spur trail that ascends the rounded crown of Mugu Peak. 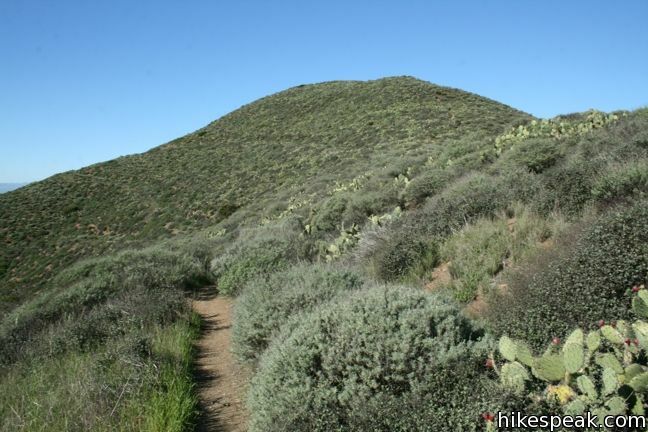 Turn right and tackle 200 feet over the final quarter mile to reach the summit. 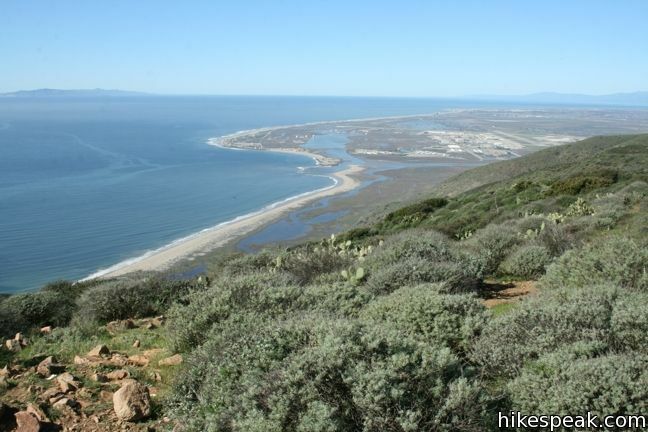 Unobstructed 360-degree views await. 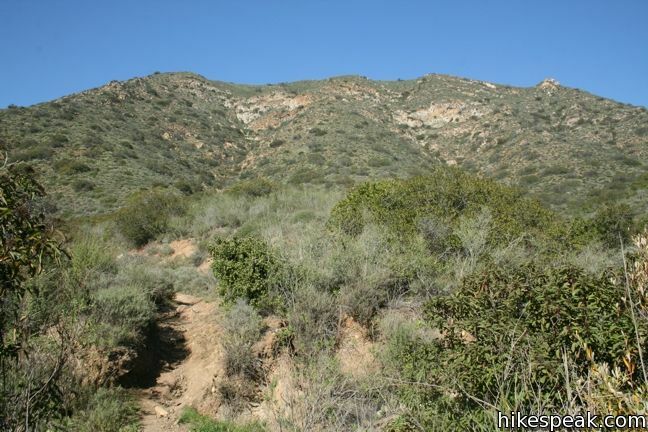 To the northeast across La Jolla Valley are the Boney Mountains, the highest peaks in the Santa Monica range, which include Sandstone Peak. 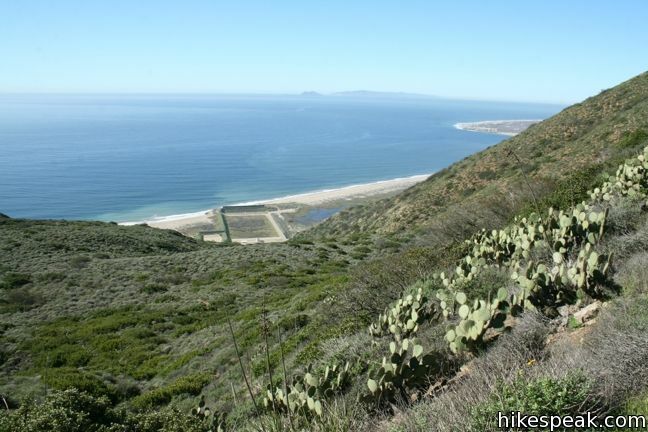 To the west, and far below, are Mugu Lagoon and Point Mugu Naval Base. 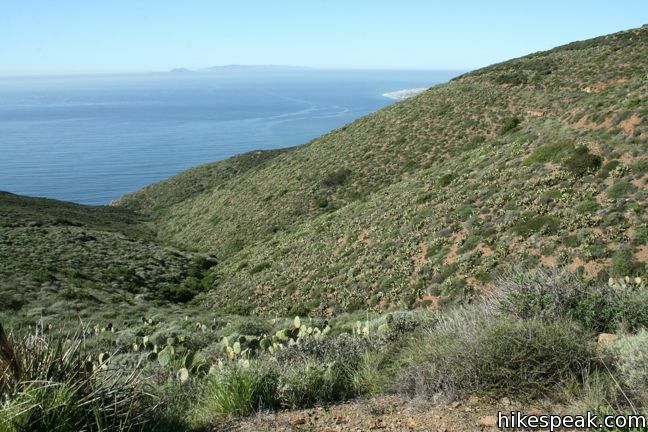 Beyond that, Channel Islands can be seen floating on the blue horizon. 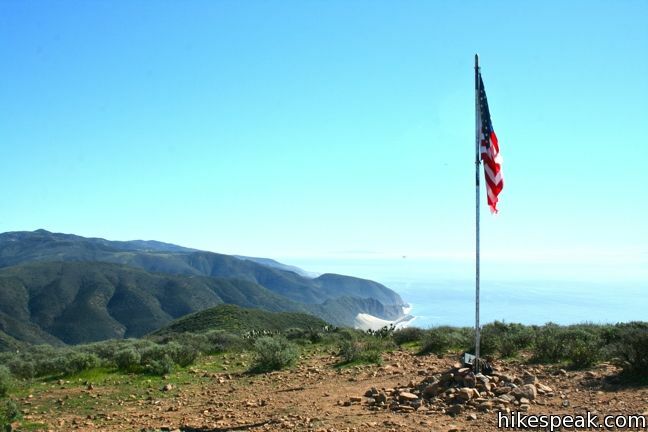 An American flag flies over Mugu Peak, giving witness to spectacular views up and down the coast. 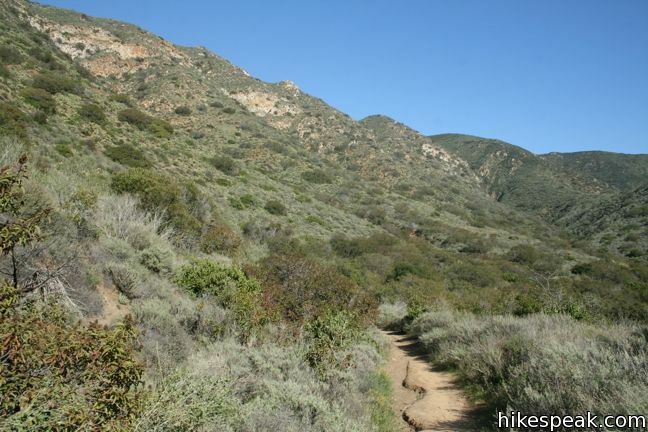 Turn around here for a 6.5-mile hike, or follow the trail across the summit and down to a saddle west of the peak at a junction with Chumash Trail and the far end of Mugu Peak Trail. 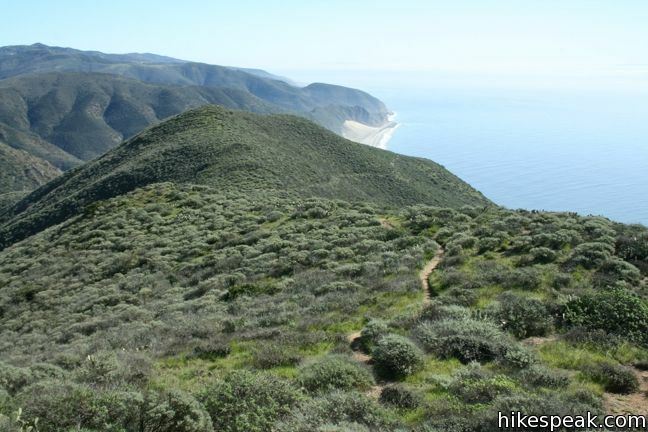 Take Mugu Peak Trail back to the junction with the spur trail east of the summit to add 1.15 miles to the hike (and more outrageous ocean views). 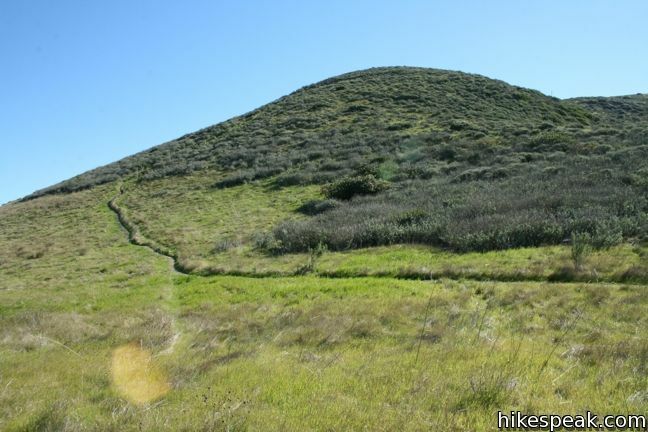 The western saddle may also be reached via Chumash Trail, which ascends 900 staggering feet over 0.6 miles from a trailhead along PCH across from the shooting range. 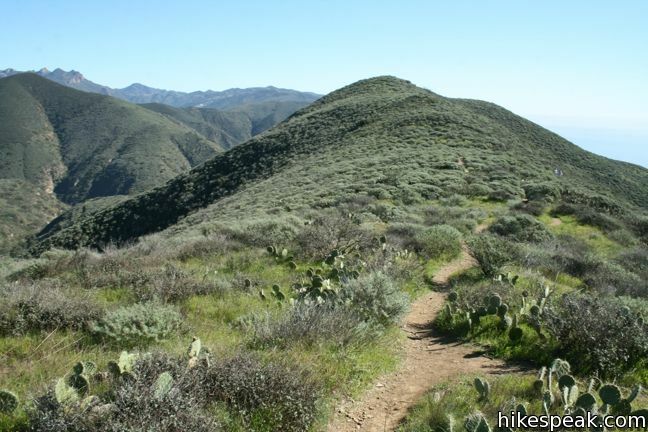 From the saddle, hikers can pick up the summit track and reach Mugu Peak with just one mile of hiking (with 1,250 feet of elevation gain). 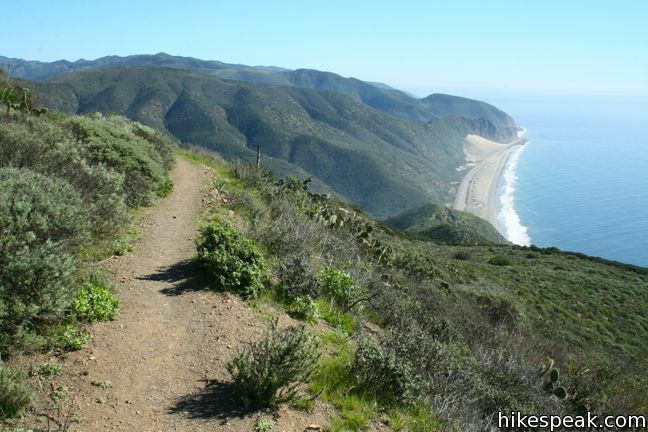 This is not a leisurely trail, but it will get you to Mugu Peak more directly than any other route. 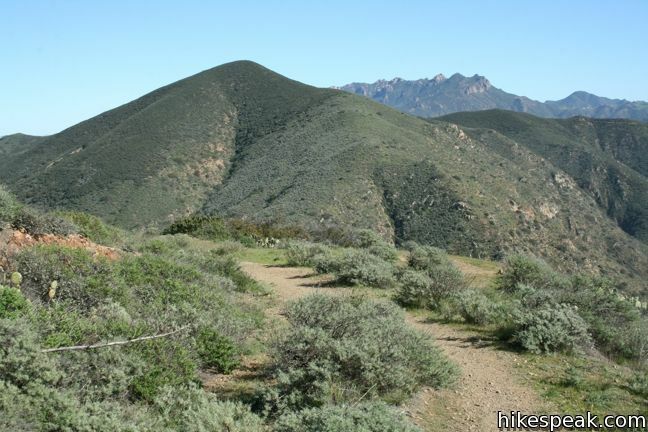 Following the trail down the east side of the summit and loop back to the saddle via Mugu Peak Trail to bring this hike up to 2.85 miles. 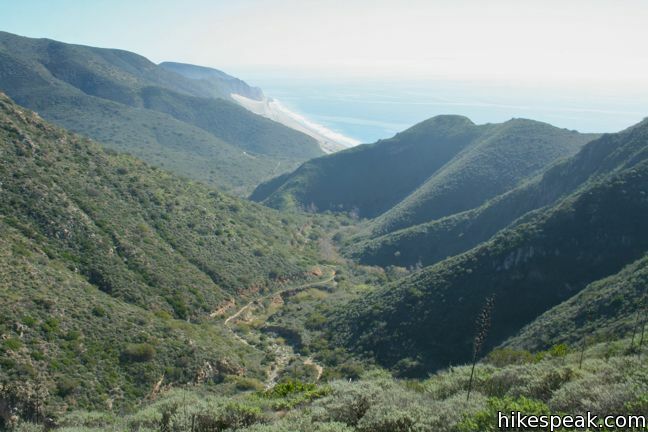 Of course the grandest way to reach the summit is La Jolla Canyon Loop, which climbs the east ridge of La Jolla Canyon, and crosses La Jolla Valley to reach the saddle west of Mugu Peak. 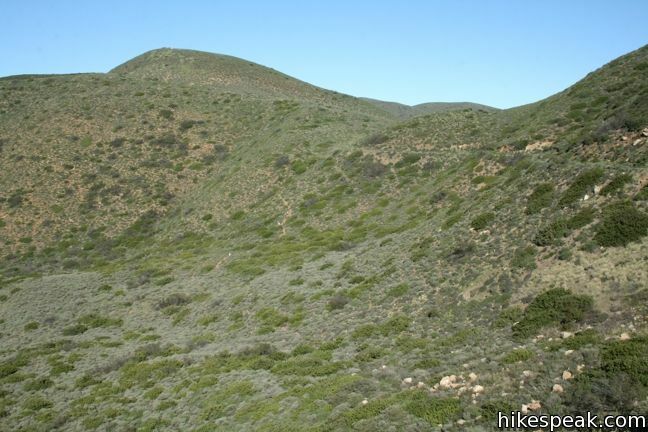 The 6.5-mile hike to Mugu Peak is steep and sun-exposed, so pack plenty of water and sunscreen. 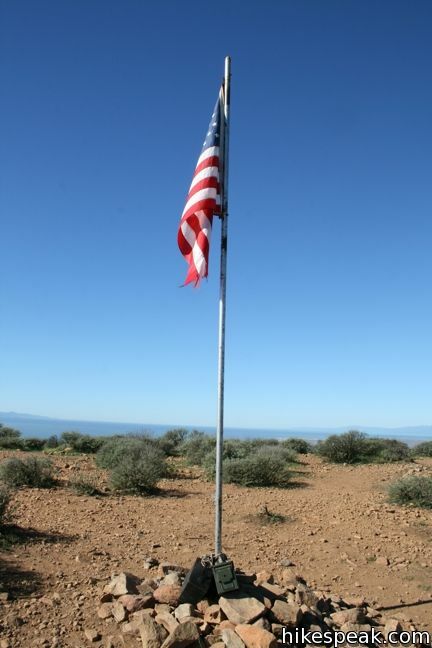 No dogs are allowed. 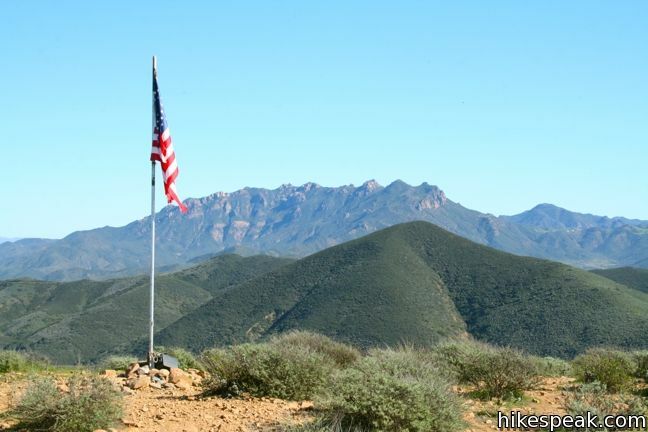 An $8 vehicle fee is charged to park at the trailhead. 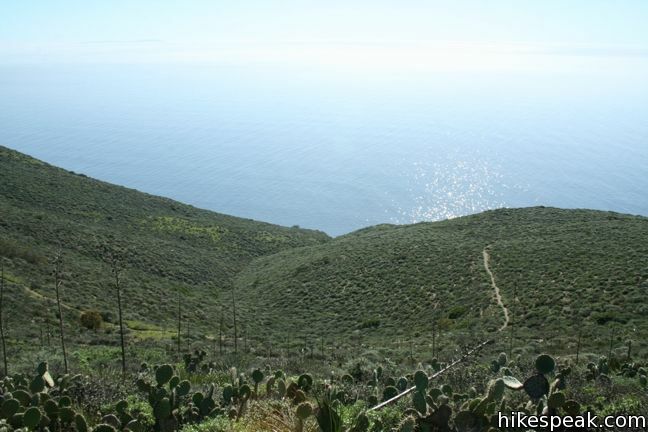 For those willing to hike a bit extra, there is free roadside parking just outside the park along Pacific Coast Highway. 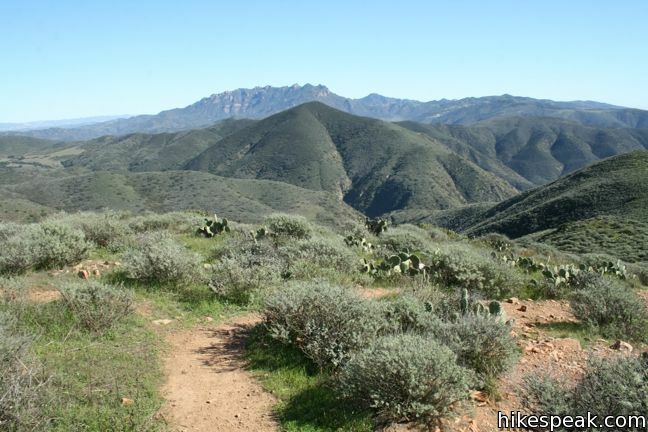 No permit is required to day hike the amazing loop, so get out and enjoy! 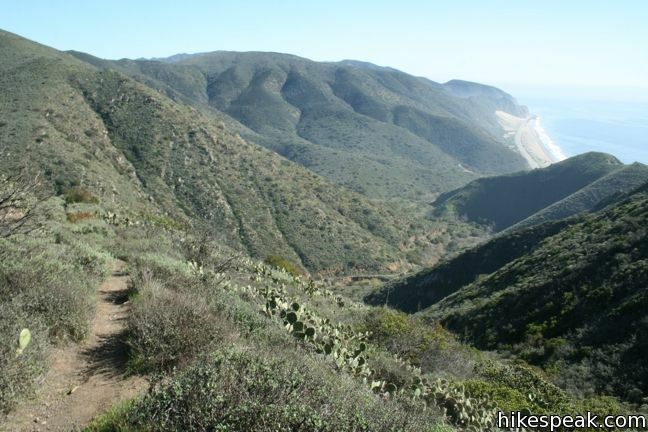 To get to the trailhead: From Los Angeles, take the 10 Freeway west through Santa Monica and follow PCH northwest for 34 miles through Malibu to Point Mugu State Park. 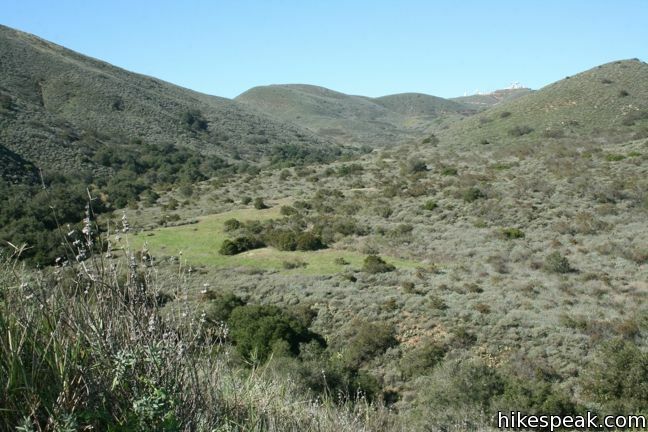 Fifteen miles past the intersection with Kanan Dune Road and 1.5 miles past Sycamore Canyon, turn right into La Jolla Canyon Day Use Area. 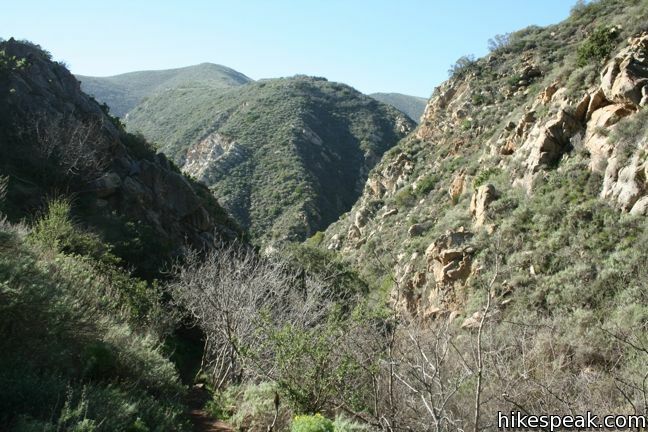 Proceed into the park to the parking lot on the left. 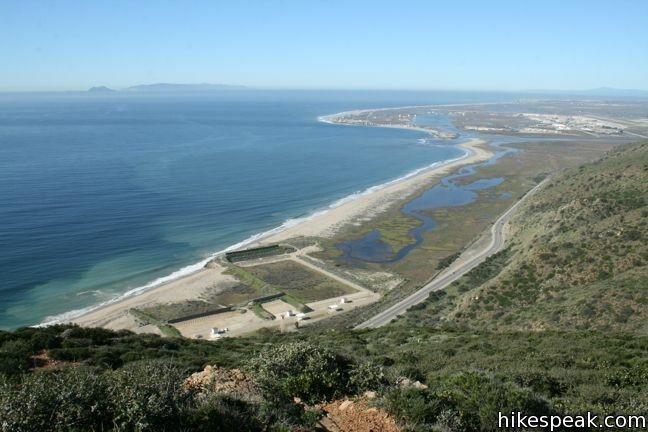 From Oxnard, head southeast on PCH for ten miles and turn left into La Jolla Canyon Day Use Area. 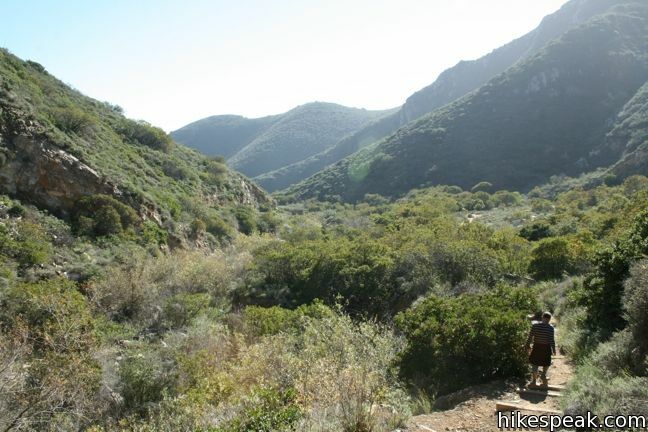 This 58-site campground in Point Mugu State Park sits at the mouth of a beachfront canyon and has access to trails through the west end of the Santa Monica Mountains. 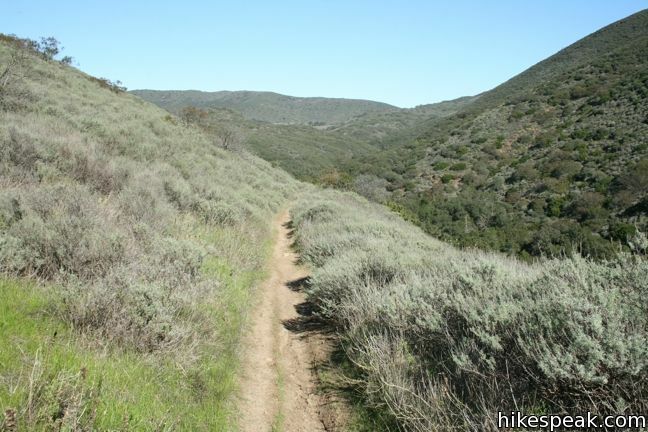 Just a heads up since we did this trail last weekend…be prepared for ticks.At one point the trail was crawling with them and they actually formed clusters. 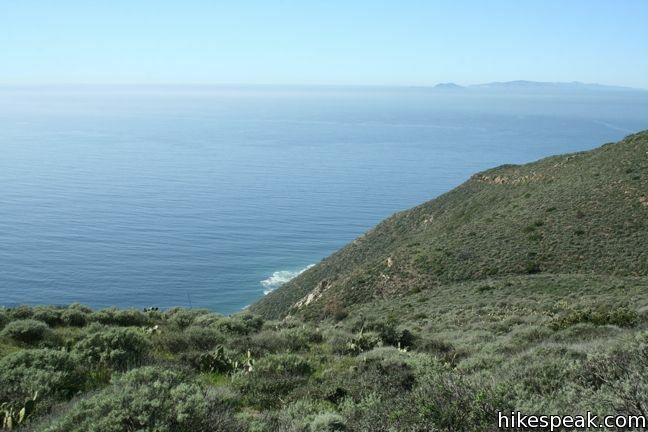 Beautiful views but I would not do it again. 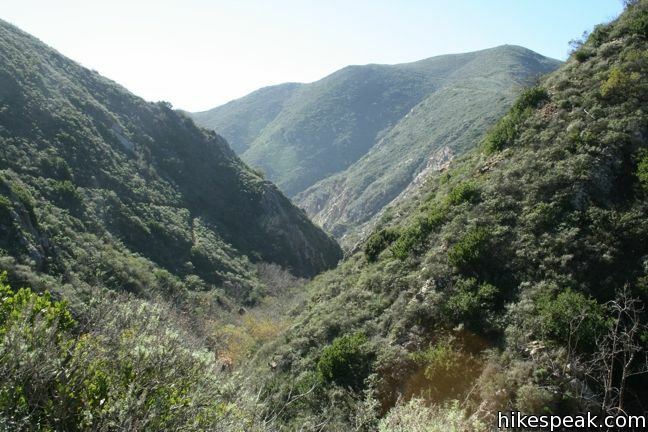 I’m hoping to hike Mugu Peak this weekend, but notice the route includes La Jolla Canyon past the falls… I tried to hike to the falls a few months ago and the trail was closed due to a rock slide… and the information I read, indicated that it would probably be closed the entire year. 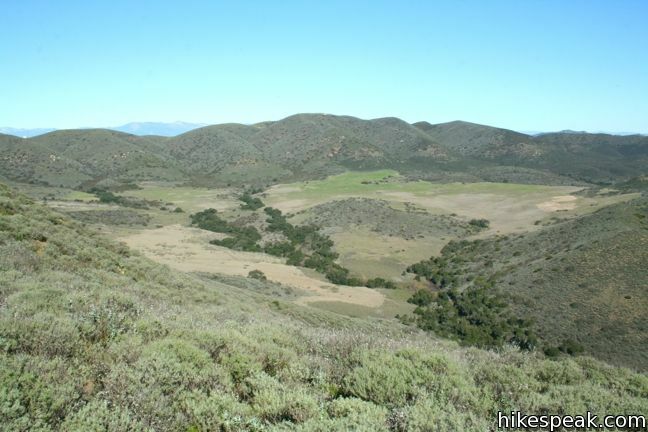 Can you tell me if this is the trail you took to get to Mugu Peak? 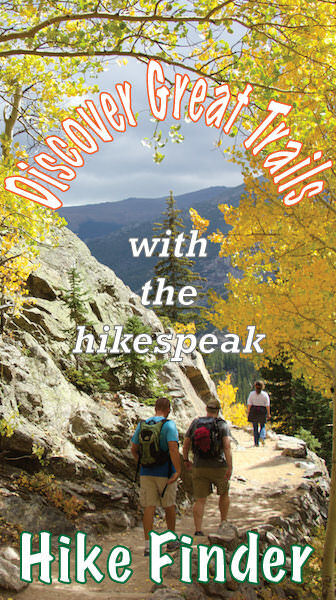 If not, will you tell me which trail you took? 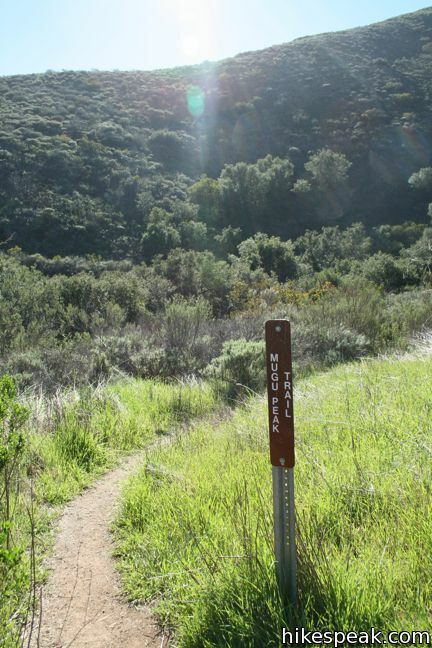 A short section of the La Jolla Canyon trail is closed. 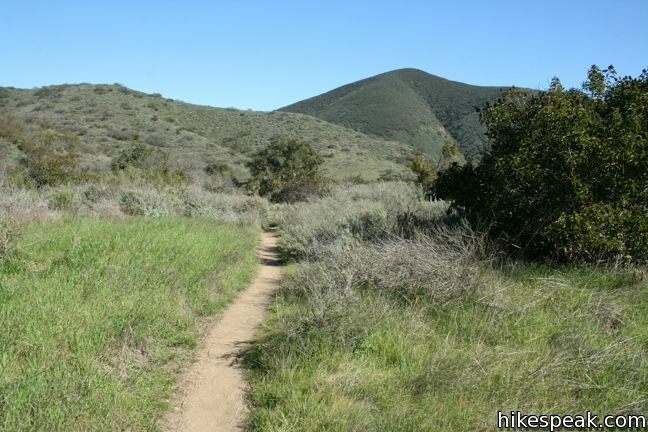 You can still get to the mountain taking the long way on the Ray Miller trail (same trailhead). 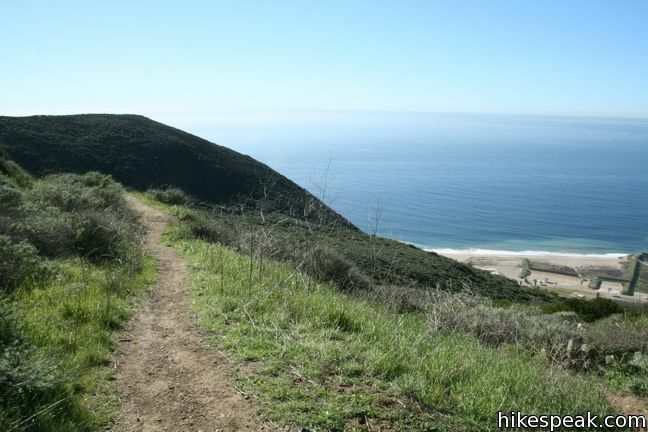 I just did this yesterday. 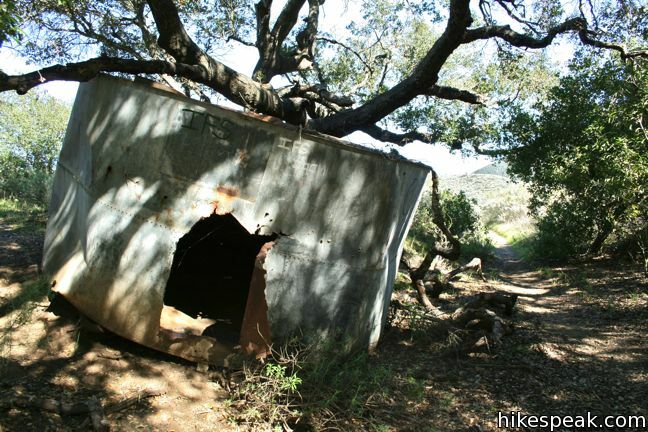 I was there on Tuesday and it was closed>> any idea if its open now? 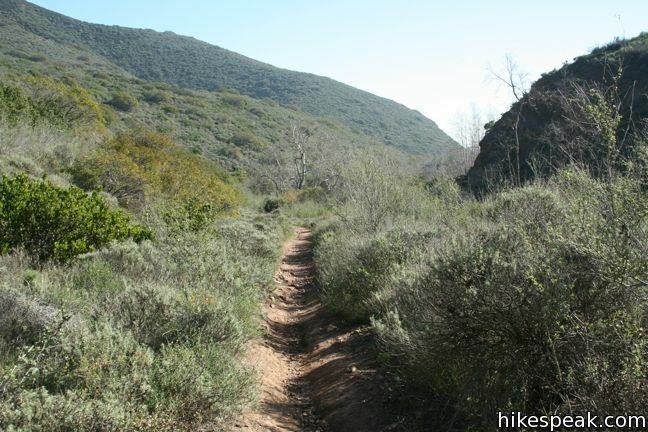 The trail was open this morning. 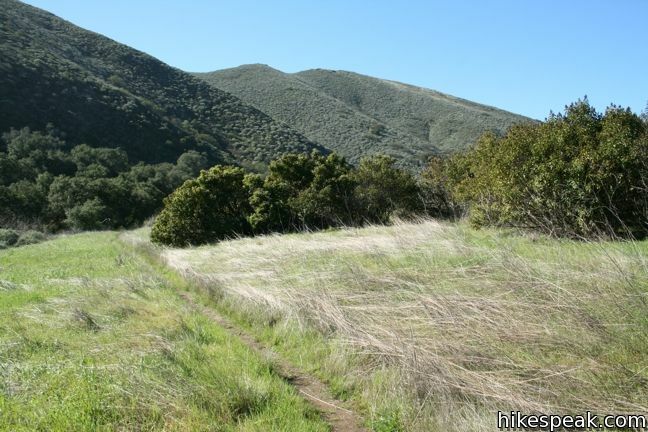 Watch your step, dogs are not allowed but some people bring them anyway.